The last years of the '50s through the first few of the '60s were important ones for pop, rock and R'n'B music. It was the era during which music was made that inspired the Beatles and Stones, Beach Boys and Byrds, Bob Dylan and Neil Young. It was the time when R'n'B bled into all aspects of popular music; from soul to surf, pop to rock'n'roll. The only problem, very few of the instigators of this new musical form gained their due respect or financial deserts. Ron Barrett was a colleague of H.B. Barnum and Richard Berry, Phil Spector and Jack Nitzsche, Bobby Darin and Sonny Bono but, sadly, he is rather less well-known. If he had spent as much time promoting his name as he did to creating music it could have been a different story. If you have a love of music from rock's 'Golden Age' then lurking in your collection are records in which he had an uncredited hand. As vocalist, musician, producer, writer or record label founder he was an active participant in the Meadowlarks' "Heaven And Paradise", the Duals' "Stick Shift" and Merry Clayton's "It's In His Kiss"; three records that admirably display his credentials and diversity of talent. 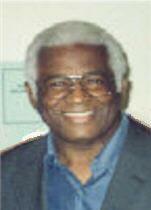 Ron was born in St. Louis in 1937, the middle child between elder brother James Jr. and younger sister Fanita. His father, James R Barrett Sr., sang tenor with one of the top gospel groups in the nation at that time, the Smith Jubilee Singers. The family all shared a love of music; Ron and his sister Fanita performed and sang together almost before they could walk, and James Jr. joined one or two groups in the '60s. Following the success of their father's group, around 1945 the family moved to Los Angeles, where Ron and Fanita were to meet many kindred spirits. Ron had been hanging out, since he was 11 years old, with another future legend of the burgeoning LA scene, H.B. Barnum, whith whom he is still friends today. Music featured strongly in their friendship, and even at these tender years they were performing for the public. In 1953, while still a student at Fremont High School, Ron and his buddies formed The Meadowlarks. They were all individually talented, and shared everything together as a group. As well as writing some tracks, Ron sang lead on many of them, and even promoted the group's concerts. The first show he put on was to raise money for the school. As well as the Meadowlarks, the show featured, among others, Bobby Day and Richard Berry. (How about that lot playing in your school hall!) When the group signed to Dootone, label boss, Dootsie Williams, decided to focus attention on Don Julian, the lead vocalist on "Heaven And Paradise", their biggest hit to date. This marked the beginning of the end of the close relationship they shared. Ron remained in touch with the newly christened Don Julian and the Meadowlarks, and sang on most of the Dootone releases, but the prior closeness was never quite the same. As Ron recalls, he worked with, and remained friends with, Don Julian right up to his death in 1998. In the mid '60s he gave Don a new song that he thought would be a hit, and it was. The song Ron claimed to have written and arranged, but not credited, was "The Jerk". Recorded by The Larks for the Money label, the song hit no. 9 on the R'n'B charts and no. 7 on the Pop charts. Check out Marv Goldberg's R&B Notes - The Meadowlarks for more information on the group. After the Meadowlarks, Ron sang and played drums with many groups. In one band, he played drums while Richard Berry played piano. He sang with Billy Ward and his Dominoes, The Robins and, with H.B., in The Dootones. He then joined The Originals, another group with a massive live reputation. Most nights he was performing, while his days were spent learning the biz from the other side of the mike. In thelate '50s/early '60s he befriended Sonny Bono and Jack Nitzsche, fellow colleagues of H.B. With the experience gained, Ron now wanted a stab at running his own label. 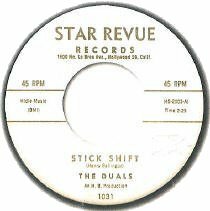 Ron's first independent production under his Star Revue banner was The Duals "Stick Shift" (Star Revue 1031). This cracking instrumental, with its sound effects giving it a commercial edge, immediately attracted attention, too much for the newly-formed label. To fulfil its potential he licensed the disc to the larger, New York-based, Sue Record label, owned by Juggy Murray. 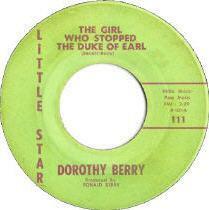 Entering the charts in September '61, its twelve week run culminated in a mid-20s position. The label of this nor subsequent releases bore any clues as to Ron's involvement. Not only that, but he got no money for it either! Hopefully with the assistance of his son Ron Jr., the financial situation is being belatedly addressed. Check out the full story of The Duals recordings, tours and struggle to get their money on The Duals Saga. Ron covers much of his later career in part two, 'Getting Started with Jack Nitzsche'. Finally, Ron Barrett is coming out of the shadows. Hopefully, the general lack of awareness of his contribution to the LA music scene will be addressed via this feature on his work with Jack Nitzsche, and his own web site, Star Revue. The site, with its "goal to create an awareness and spotlight artists of the doo-wop era, as well as educate the public on '50s and '60s music", is in the early stages of construction, but already rich in promise. A thank you to Ron Barrett for giving his time to tell part of his life story; how he first met, worked and befriended Jack Nitzsche. And thanks for some very cool photos. Ron's son, Ron Jr. deserves special thanks for his initial contact, discography additions, help and encouragement with this page. He is rightly proud of his dad and his respect shows.